I have really been mixing it up today, my first port of call was a meeting at Annecy le Vieux. I was there to sign the contract and pay the deposit on a flat in Cluses that I will be sharing for a few weeks in February with my, soon to be retired, cousin Paul. To my own amazement I set the meeting up, via the telephone, in French. Then met and discussed the finer details, including how I wanted the bedding arranged. I have either done very well or will be in for a surprise in a few weeks time. Annecy is a lovely old town next to a huge lake and surrounded by hills and mountains, a bit like a smaller version of Geneva, best of all it is only about 30 minutes from the ski resorts of the Aravis. So it was a brisk drive uphill to Le Grand Bornand, right past the Firem factory at Villard sur Thones with a skibike sign hanging from the side. I have been really looking forward to getting my "new" skibike on the snow and riding it. It's not really new though, it's the original Marin East Peak that I converted way back in late 2009, then rode in Scotland, Andorra and France skibob style. The cosmetics of the frame needed a little tidying up, so I sent the rear triangle to be blasted and powder coated. I put on new Suntour forks of the same type as I have already been using and a similar coil suspension unit at the rear. I put in an adjustable stem in order to get the same amount of rise that I am used to, although with a fair bit less reach. The sliding elements are second hand Head "Big Easy" 95cm skiboards in good condition. The result turned out much as I was expecting, the ride is fine, the hard and undamped rear suspension is something I have become accustomed to. 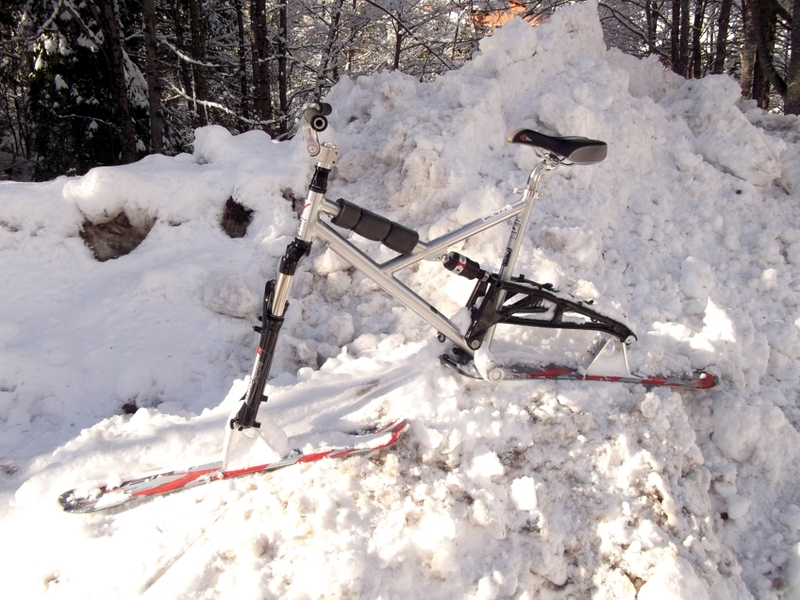 Being a medium frame, unlike my other skibike which is large, it felt more nimble. I immediately felt at home with the shorter reach and the slightly different feedback this creates. The Head skiboards seem to have quite a forgiving nature with a delightfully smooth transition from grip to slip. Sadly there was one element that doesn't work and radically curtailed my test session. My new old Marin based skibike - needs better pegs! The skibike adapters are by Russian manufacturer Ski X Bike and are near identical to the Alpine SkiBikes adapters I have used for many years now, so no complaints there. But for your feet they come supplied with a pair of round knurled BMX pegs. I had my doubts about these, I tested this configuration with Tommy from BikerMads in Stockholm last year and found them to be very slippery in the snow. Annoyingly today was exactly the same, the pegs are sharp enough when dry to snag clothing, but the merest hint of frostiness and ice fills the grooves to leave a totally slick surface. This is worse than useless, as you have somewhere to put your feet, but the minute you need to apply pressure, your foot shoots outwards throwing you off balance. After a couple of wobbly moments at quite low speeds I lost all confidence and limped back to the base station. I will swap out these pegs for the Alpine SkiBikes design and try again, but this leaves me a skibike short. So please if; Tommy at BikerMads, Serge at Firem, Martin at Bullskate, Thierry, Wayne or Carl read this and have spare pegs to sell or new products to test and endorse, please mail me as soon as possible. I am hoping to use the bike for demo rides next week, but couldn't take the risk of letting a novice on it in this condition and couldn't properly demonstrate riding if my feet slip off at every turn. With the SkiBike disassembled and back in the boot, it was time for a spot more skiing practice to fill the afternoon. 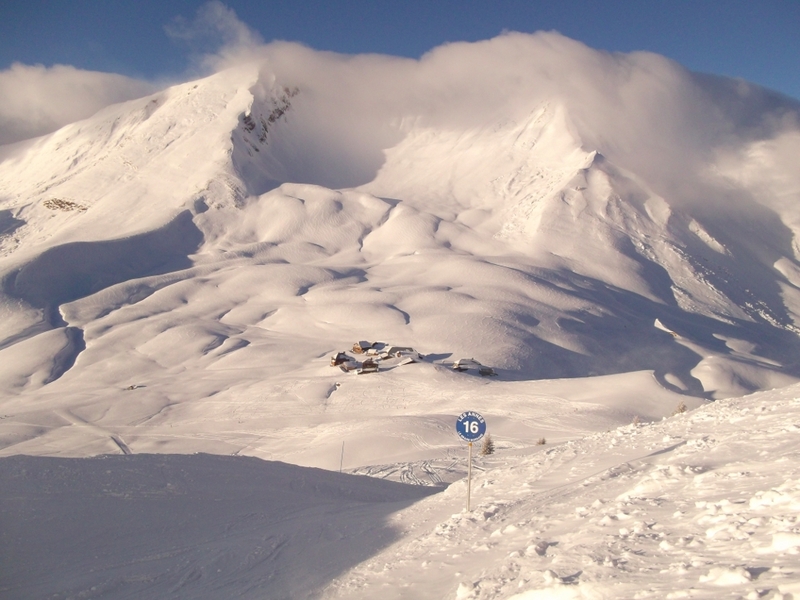 One advantage of this was that I was able to use the smaller chairlifts that Grand Bornand will not allow you to take a skibike on. One of these gets you to a wild "back country" area with a couple of gentle pistes that run for quite some distance. It was very chilling both spiritually and physical as a keen East wind had picked up and started to blow in cloud. There are also huge off piste opportunities in this area and there was powdery snow in abundance, what a joy this area would be by skibike, we need a skibiker blog helicopter.